IM Andrew Martin tribute video, which features an excellent win by Colin against GM Dave Norwood, taken from the 4NCL played at Birmingham in November 1998. Chess lovers have lost a witty, passionate and prolific writer about the game, who nurtured some of its young talent. Colin Crouch, who has died aged 58, won the British under-16 championship in 1972 with 10 wins and draw, soon after he started playing club chess in north London. He became an International Master two decades later and scored memorable wins against Grandmasters. “It is always a treat to read a book by Colin Crouch,” wrote Washington Post chess columnist Lubomir Kavalek, and his books attracted players at all levels. His final work on Norwegian chess wunderkind Magnus Carlsen was well received. “Readers could relate to him because he was a very honest writer, critical of his own mistakes and willing to admit to them, he never lectured readers,” said John Emms, editor of Crouch’s last five books for Everyman Chess. Born in Bushey, Hertfordshire, Colin was the son of John, a civil servant, and Audrey (nee Jackson). As a small boy he learned to play chess from his father at their family home in Harrow Weald, which remained his home until his death. He began to play competitively at Haberdashers’ Aske’s school in Elstree and then at Christ’s college, Cambridge, where he took geography, completing a doctorate at Durham University on unemployment in mining communities. Crouch was an active Fabian and Labour party member. In 2004 a stroke severely damaged his health, leaving him in a condition where he could barely walk, had damaged arms and “only half of one eye working”. While others might have given up the game, his instincts were to play chess seriously “to recover my thought processes”, he wrote. In 2008 and 2012 he won silver medals at international chess Olympiads for the blind and visually impaired in Greece and India. “It meant a great deal to him that he’d actually been able to prove that he could still achieve at the top,” said Chris Ross of the Braille Chess Association. Crouch’s burly, bearded form and distinctive chuckle were well known in chess circles. 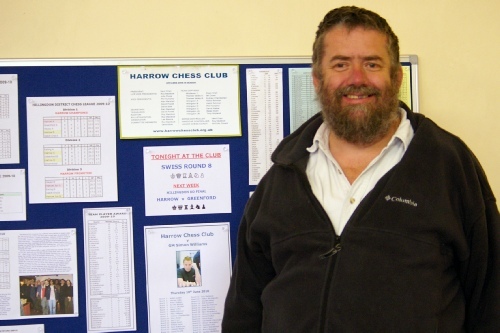 He had a passionate dedication to coaching younger players every week in Harrow Chess Club, among them future International Master Lorin D’Costa. “Nothing would give him more pleasure than seeing one of his juniors doing well,” said Nevil Chan, the club’s president. He is survived by a brother, Richard, and a sister, Elizabeth.